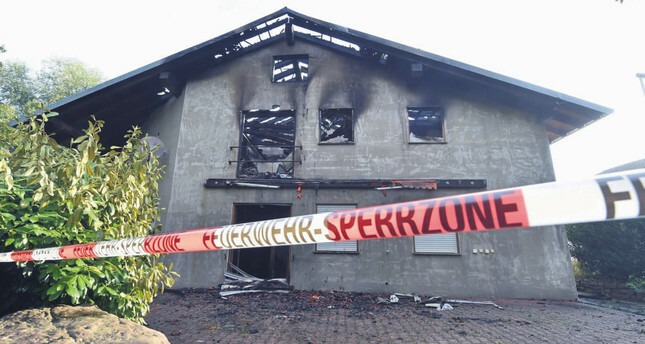 Exterior view on a planned refugees home that burnt down on July 18 in Remchingen, Germany. Germany has received more asylum applications than any Western country in the past few years, with 202,815 people applying for asylum. The dramatic rise in refugees, mostly coming from the Middle East and Africa fleeing war and violence, has been followed by increasing attacks against migrants fueled by xenophobia. Migrants struggle to cope with such attacks and discrimination in Germany where they arrive with the hope of starting a new life. Almost no day has passed this year in Germany without an attack on a refugee shelter. The number of arson incidents or similar attacks reached 150 in the first six months of 2015. According to German government data, newly renovated shelters for the 450,000 expected asylum seekers were destroyed or damaged, mostly by local protesters. The attacks also create tension between those who are against the arrival of refugees and those who support them. German Justice Minister Heika Maas expressed his concerns regarding the issue, saying he "feels the hatred towards the foreigners out on the streets of Germany." The ministry highlighted the increase in attacks on shelters, as there were around 50 attacks in 2013 and 150 attacks in all of 2014. In June, a center for asylum seekers was set on fire in the town of Tröglitz, where members of the far-right National Democratic Party (NPD) were protesting the relocation of around 40 asylum seekers in the town. Even though authorities strive to cope with the problem, the attacks against the refugees cannot be prevented. Sigmar Gabriel, the German vice chancellor, commented on the arson attack in Tröglitz, and said Islamophobia, anti-Semitism and hatred for foreigners had no place in Germany, as refugees should feel they belong in the country. In May, following a community soccer tournament in the rural town of Neuhardenberg, a group of local young men targeted the team of asylum seekers who had also taken part in the competition, the United Nations High Commissioner for Refugees (UNHCR) stated in a report released in June. "When we left the field, they shouted at us and threw bananas at us," recalled Rashid Ahmed, an asylum seeker from Somalia. Throwing a banana at some is considered a racist insult that is seen in European soccer stadiums, mostly directed at black players. Similarly, in December 2014, a hostel destined for use by asylum seekers was damaged near Nuremberg, an attack in which swastikas and anti-immigration graffiti were also seen on the walls. Moreover, Arsonists torched a shelter in the southwestern town of Remchingen, causing 70,000 euros in damages, and assailants fired guns at the windows of another shelter in a town near Leipzig last Saturday. The Amadeu Antonio Foundation, a nongovernmental organization (NGO) that keeps track of violent displays of right-wing extremism in Germany, said in a 2014 report that the number of attacks against mosques has also increased, indicating growing Islamophobia in the country. The organization cited dozens of attacks in the report, saying even children and old or disabled persons are targeted in the growing number of attacks and violence. Many German cities and towns witnessed similar attacks targeting asylum seekers, ethnic minorities and Muslims throughout 2014, and attacks continue in this year as well. While the attacks on refugee shelters have come to the forefront, the Bavarian state government came under fire on Tuesday for its plans to set up so called "deportation camps" near the German-Austrian border exclusively for people from Balkan countries. Bavarian Minister-President Horst Seehofer said that two camps would be set up near the border to accelerate the deportation of asylum seekers from Balkan countries classified as safe and therefore likely to be deported. The plan has been harshly criticized by human rights groups who dismissed it as "right-wing populism." It has also been criticized as state-sponsored institutionalized discrimination. According to Deutsche Welle's Hendrik Cremer, a human rights policy adviser at the German Institute for Human Rights said: "If people are categorized according to their origin into special reception centers, it doesn't square with their right to asylum. Segregation like that, based on their origin, is a violation of the human right against discrimination." Opposition parties also accused Seehofer, who heads the conservative Christian Social Union (CSU), of stoking anti-immigrant sentiment and right-wing assaults on migrants. Anti-immigration ideology and xenophobia have become more visible in the country as a result of the efforts of political parties like the NPD and Alternative for Germany (AFD), as well as anti-Islam and anti-immigrant initiatives like Patriotic Europeans Against the Islamization of the West (PEGIDA), which have staged anti-immigrant rallies and drawn thousands of people throughout Europe and especially in Germany. The government, on the other hand, is criticized for lacking a coherent strategy to address migrants, failing to move quickly and decisively enough to prevent the violence and indirectly encouraging attacks through inaction. According to the UNHCR, EU countries have received an estimated total of 436,000 asylum applications in 2014 with Germany receiving the most. About 400,000 people are expected to apply for asylum in the country by the end of 2015. Most arrivals came from Syria, Serbia, Albania, Iraq and Afghanistan.